This is a guide how to create an SMS campaign in YoungCRM. Access the SMS module and click 'Create SMS'. Then, you're asked to select the people you would like to send the SMS to. You can manually select people, select all at once, or you can use one of your saved views. When the receivers have been selected, click 'Send SMS'. The first step is to name your SMS campaign. This makes it easier to manage your different SMS campaigns in future. 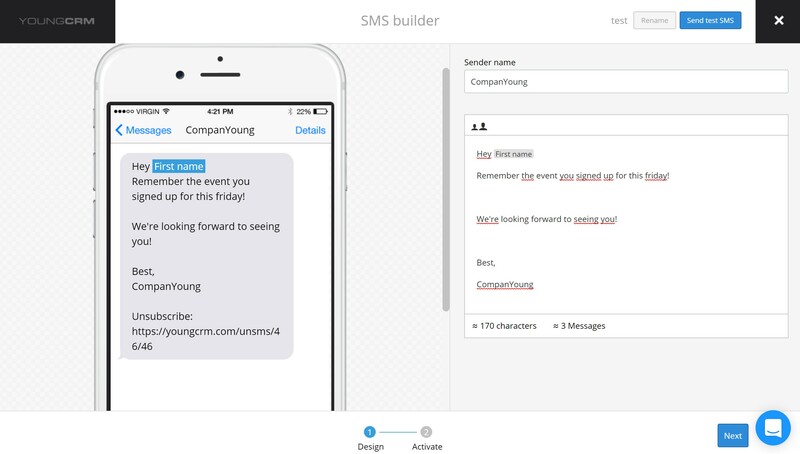 Now, it's time to design your SMS. Specify name of the sender or phone number and write the text. You can utilize shortcodes, which means that the person's personal information such as first and last name as well as email is drawn from the system and the SMS is automatically personalized to the individual. Shortcodes are found in the empty bar under the name of sender (see picture below). Note: At the bottom of every SMS. you'll find a link where people can unsubscribe from future text messages from your organisation sent via YoungCRM. When you've designed your SMS, send it to yourself to see how it looks and to make sure everything is on point. Click 'Send test SMS' in the top right corner. Enter the phone number you wish to send the test SMS to. When you've finalised the design of your SMS and it's ready to be sent, click 'Next'. Send the SMS by clicking 'Send SMS'. Now, the SMS campaign has been created and can now be found in the SMS module. Tip! : If you would like people to answer your SMS, enter a number as sender of the SMS. Answers will be sent to this phone number. You cannot receive answers directly in YoungCRM.